MARIUPOL, Ukraine -- On the edge of the city here, members of the 37th Mechanized Infantry Battalion are living in cramped bunkers sunk about 8 feet into the black earth of farm fields. The small spaces are jammed with bunk beds, weapons, food and the occasional stray cat or dog. The conditions are rough, but not dismal, and reflect the battalion’s motto, “Nobody But Ourselves,” a nod to the reality that Ukrainians — and particularly members of this volunteer battalion — have to rely on their own resources to defend their country. When the fighting started last spring, Ukraine had approximately 4,000 combat-ready troops, serving in a military debilitated by corruption. The military’s best weapons had been sold off and training was minimal. In response, many Ukrainians began organizing themselves into volunteer battalions, like the 37th Mechanized Infantry Battalion. 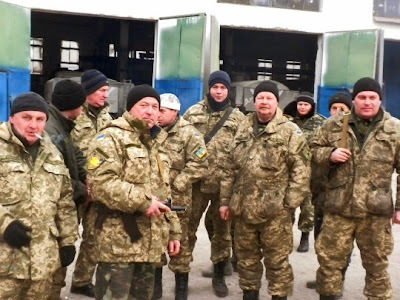 With about 430 men, the 37th battalion is one of over a dozen private battalions that have sprung up in Ukraine since Russian-backed separatists began taking over portions of eastern Ukraine. For the past several months, the battalion has been based in the southeastern port city of Mariupol, on the Azov Sea, at a former truck repair facility. The 37th battalion was formed last September in Zaporizhya, a city in southeastern Ukraine, when Alexander Lobas and some of his former comrades from airborne units living in the city formed a self-defense committee to counter pro-Moscow protesters bused in from Russia and to block an attempt by Russian special forces to seize a government arsenal and hand it to the rebels. Lobas, 55, is now known to his men simply as “Kombat,” short for Commander of the Battalion. “We couldn’t stand by and watch this new Hitler, Putin, occupy our land,” said Lobos, who had been a colonel in the Soviet-era military. Like other volunteer battalions, it’s a makeshift operation. The government provides a basic three-week national guard training course, and the battalions get small arms, artillery, tanks and armored personnel carriers, along with fuel and ammunition. Everything else is provided by contributions from individual donors and support groups. These contributions include everything from cash and food to uniforms and more sophisticated military gear, like night vision goggles, encrypted communications equipment and thermal-imaging sniper scopes. The donors range from wealthy “oligarch” businessmen to ordinary Ukrainians who donate a sizable proportion of their wages. The 37th has its own rich patron, Yurij, who is involved in Ukraine’s gas industry. “I heard about plans to form this battalion and felt I could help,” said Yurij, who asked that his last name not be used because of his business interests in Russia. Yurij helped purchase vehicles, weapons, communications and other equipment and paid for specialized training. Individual volunteers deliver bandages, medicines and personal medical packs, and have also furnished the battalion with an ambulance equipped with resuscitation equipment. As its name implies, the battalion is mostly infantry transported by trucks and armored vehicles. Some vehicles have been provided by the government, including two shabby-looking Soviet-era military ambulances. Others are ancient vehicles resurrected by the 37th’s mechanics, including a few T-64 tanks. The battalion’s fighters are responsible for manning checkpoints built of concrete blocks that line the route out of the city, but there’s also an intelligence division made up of some 30 men housed separately from the other battalion members. Those involved in intelligence are trained to penetrate behind enemy lines to scout out the locations and numbers of separatists, and to act as forward observers providing enemy coordinates for Ukrainian artillery. Ruslan, 38, a former Ukrainian army soldier, has two others on his intelligence team — Kostya, 27, and Zhenya, 19. They are tasked with looking at whether the pro-Russian separatists are pulling back their artillery as stipulated under the ceasefire agreements. “We haven’t seen any evidence of that,” Kostya said last month. The 37th Battalion is responsible for a section of the front line several miles east of Mariupol, around the small town of Sherokyno, which saw some of the fiercest fighting before the current ceasefire. Despite that ceasefire, Ukrainian forces say their positions on the Mariupol front have come under fire almost daily. The Ukrainian Government, NATO and the United States report that Russian separatists and regulars are readying for another major assault against Ukrainian forces, including those around Mariupol. Still expecting a Russian attack, Ukrainian army engineers have used bulldozers to dig trenches, creating a landscape reminiscent of World War I. “I left the army 15 years ago and never thought I’d see war again,” said “Marker,” a lanky Soviet Afghan War veteran. Marker, who like many in the battalion publicly identifies himself only by his nickname, has already fought in Afghanistan, Chechnya and Africa. He returned to war, he said, because of Putin’s aggression, which is replaying the horrors of the last century’s warfare.